MANY laboratory protocols are time consuming and laborious, but may not lend themselves to lab automation because they combine functions on several channels. Aurora Instruments says its new Versa 10 automated liquid handling workstation goes some way to solving this problem. Versa 10 combines automated dispensing on four or eight channels with a cherry-picking function on a single channel. Air displacement pipetting provides accurate dispensing and prevents cross-contamination. Set-up can be customised, with optional deck modules allowing users to configure the workstation for general liquid handling, PCR plate formatting, sequencing set-up, etc, as desired. The range of optional modules includes plate heaters, reagent coolers, and shakers. The company says the Versa 10 enables PCR set-up in 96-well microplates in just six minutes, and that 384-well plates are also accommodated. 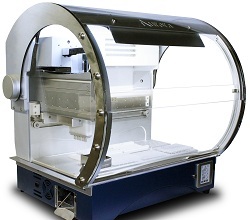 Aurora says the Versa 10 handles all common reagents and labware in a compact footprint to maximise laboratory efficiency, and is suited to installation in hospital research, diagnostics, and agricultural research laboratories.